Our friends at Nugen Audio have shared with us some of their upcoming product plans and what they plan to show at BVE 2015 in London later next month. The EBU have recently published an update to their R128 loudness standard to cover short form content like adverts and promos. The EBU R128 S1 will be supported with updates of Nugen’s Loudness Toolkit and LMB products and they plan to release the updates to coincide with BVE 2015 in late February and will include a series of presets implementing the recommendations covered in the new supplement to R128 for short-form content. Their aim is to simplify and accelerate configuration for those working to the new measures. These updates will be available free for all existing users when they are released. At BVE 2015, Nugen Audio will also be previewing a new upmix process specifically designed for film and TV production. They are designing it to be capable of producing a downmix-compatible upmix with optional dialogue isolation in the centre channel. They hope that this new technology will be available early in the second quarter of 2015. 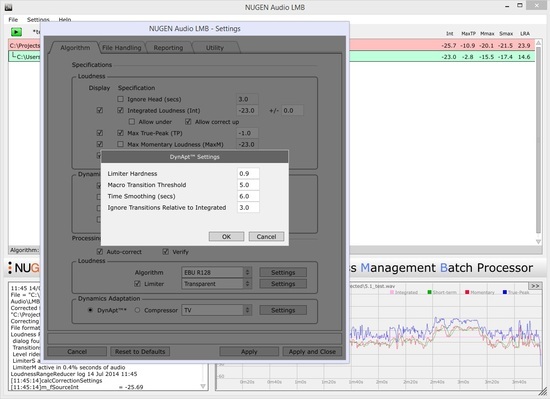 Nugen Audio’s LMB Processor is an offline, file-based loudness analysis and correction program for high-throughput applications, great for handling legacy and back catalogue content as well as integrating into current broadcast production workflows. 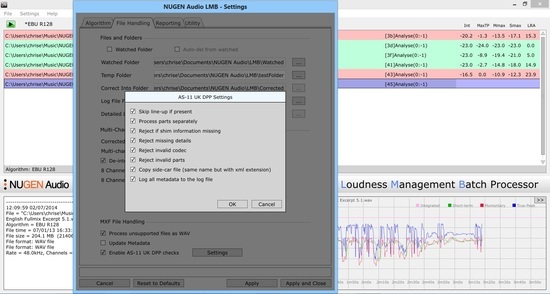 The MXF Extension for LMB Processor allows automated analysis and loudness correction for the audio elements within MXF files. Nugen’s MXF Extension has been updated to include DPP AS-11 compatibility and is available now free for all existing users. Nugen Audio is a participant in the DPP compliance program, an initiative set up by U.K. public service broadcasters to help speed the transition to fully digital production and distribution for television to unify the delivery specs for all UK broadcasters, both public and commerical. As a member of the AS-11 DPP (Digtial Production Partnership) compliance and certification programme, Nugen Audio is working hard developing quality assurance criteria for the AS-11 DPP specification for digital file formats. They are to be commended for getting invloved and using their expertise to help develop and refine the standards and other countries and territories could do a lot worse than limplement a unified delivery standard along the lines of the UK’s DPP. Adapting dynamic content like cinema theatrical releases for TV or taking TV content and preparing it for mobile streaming can be a challenging task, particularly in relation to dialogue. At BVE 2015, Nugen Audio will also be showing this DynApt™, Dynamic Adaptation Technology, which they describe as a groundbreaking solution for intelligent repurposing of audio for TV and streaming at faster-than-real-time speeds. The DynApt algorithm has been designed to adapt the dynamic content of audio appropriately for different listening environments and playout systems while respecting the level of dialog in the original mix and meeting specific loudness criteria. But the good news is that you don’t have to wait until BVE, the first implementation of this new technology is already available as a DynApt Extension for their LMB Processor. It is great to see a small company getting stuck in and delivering the appropriate tools to enable us to work with the new loudness delivery workflows. Our very own Mike Thornton will be presenting a loudness training seminar at BVE 2015. Keep a lookout in the seminar programme for BVE to see when it is.